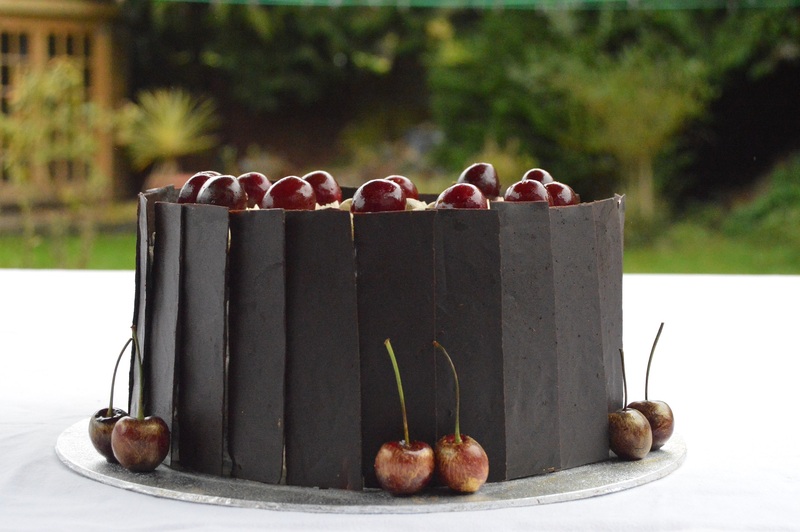 Another version of my favourite over-the-top dessert cake; although I am well aware I have blogged about a few Black Forest Gateaux I have made, with little tweaks to the recipes here and there! I still argue, though, that a good Black Forest Gateau is a joy to eat in all of its retro kitsch-ness! Most of the cake components can be made in advance, so that this is mostly about the assembly ie) the sponge layers, chocolate panels, cherry decorations, whipped cream….. 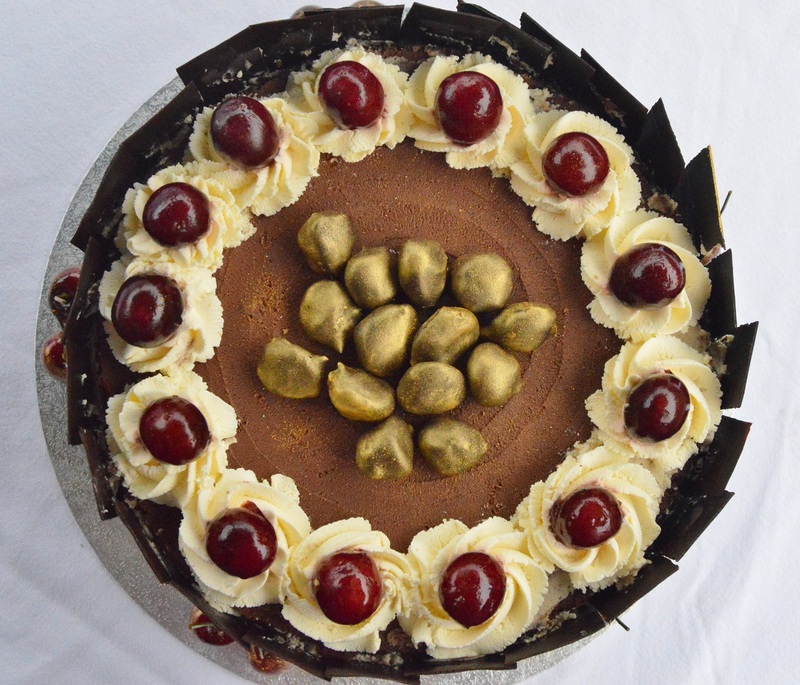 I filled and decorated the cake with dried cherries that had been soaking in Kirsch for months: I always have a jar of these that I top up with cherries and Kirsch as I use them, either thrown into traybakes, spooned over ice cream or just munched on as and when I feel like it! I dipped some of these macerated cherries were in melted dark chocolate and brushed them with edible gold lustre for a “gold rocks” appearance. I also dipped some whole dark cherries in a cherry caramel – but just brushed with a Kirsch syrup (boil Kirsch with a little sugar until it reduces and becomes slightly thicker) would work wonderfully. (1) Make the sponge: preheat the oven to 170C(fan) and line three circular 8″ cake tins with greaseproof. (2) Whisk the eggs and sugar together until light, moussey and thick. It should hold its shape easily. Sift the flour and cocoa powder together and fold carefully into the egg mixture, using about a third at a time. There should be no pockets of flour in the mixture. Slowly pour the melted butter down one side of the bowl and fold in until there are no streaks of butter visible. (3) Pour the mixture into the tins and level. Bake for 12-15 minutes until well risen and just starting to shrink from the sides. Leave to cool in the tin before inverting, removing the greaseproof and trimming to about 30cm by 14cm. Spoon over the Kirsch liberally and set aside until needed. NB: the sponges can be frozen at this stage if preferred. (4) Make the ganache: put the cream in a small pan and bring to the boil. Remove from the heat and add the chocolate. Stir well until melted and mix in the cherries and the Kirsch. Cover and leave until cool and firmer. (5) Make the cream filling: whisk the cream with the sugar and the vanilla until thick enough to easily hold its shape fully: you want it firmer rather than floppy. Set aside until needed. (6) Make the chocolate panels: spread the melted chocolate thinly over acetate or greaseproof paper. Leave to set and carefully peel off the greaseproof. Cut into rectangular panels, using a knife dipped in hot water to give clean cuts. Alternatively, snap the set chocolate into random shards, going for larger rather than smaller shards to get height. (7) Make the cherry caramel: put the sugar, vanilla pod and Kirsch into a small pan and bring slowly to the boil, shaking the pan occasionally rather than stirring to help the sugar dissolve. Boil for several minutes until the syrup starts to caramelise. Remove from the heat and dip the cherries in the caramel to coat, using a cocktail stick for ease. Place on a silicon mat or greaseproof paper to set. Ideally do this up to a day before you want to serve it, otherwise the caramel will start to dissolve. 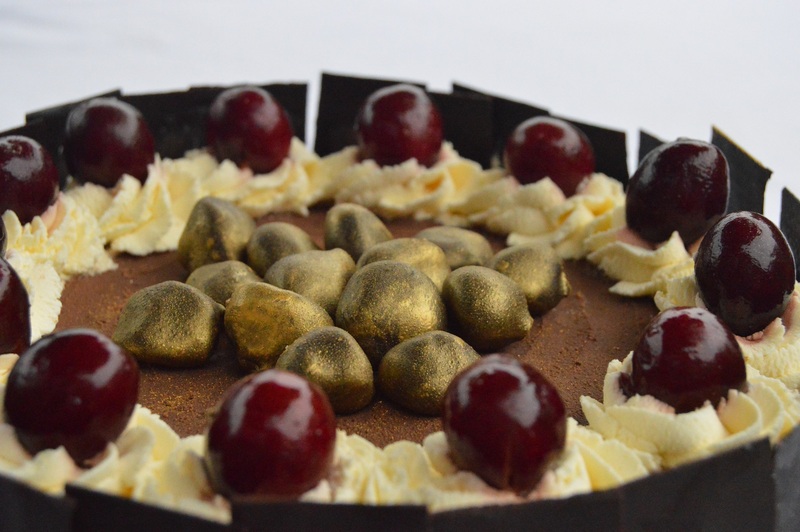 (8) Layer up the gateau with the Kirsch-soaked sponge, cream and ganache and the macerated cherries. If you have any of the caramel left, dissolve it with a little more Kirsch, leave to cool, and brush over the layers. Place the next sponge layer on top and press down gently. Repeat with the final sponge layer. You will not need to use all of the cream and the ganache for this. (9) Coat the outside edge of the cake thinly with the remaining ganache or double cream, and spread ganache over the top. (10) Place the chocolate panels around the sides, overlapping slightly: the ganache or cream will ensure the chocolate panels stick to the cake. 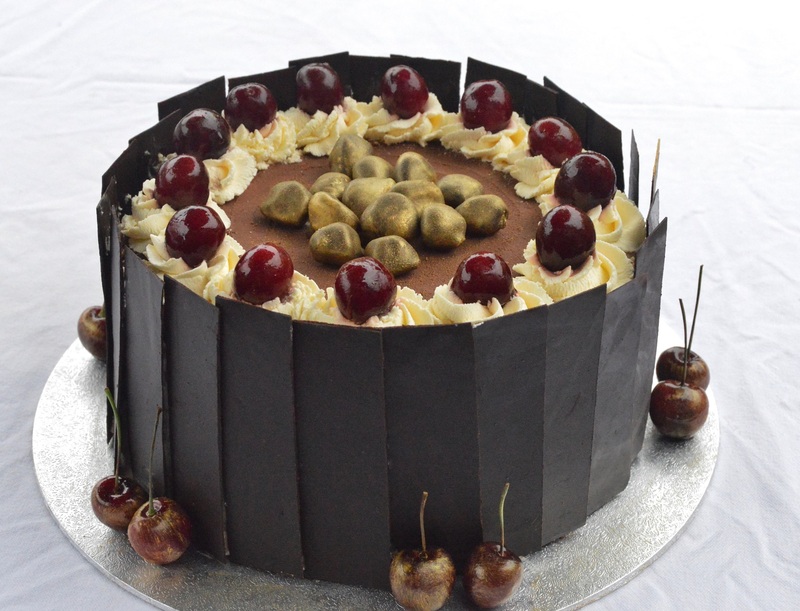 (11) Top with chocolate coated cherries and perhaps some whipped double cream piped around the edge. thank you – and it is always such a wicked treat to eat a BFG!